Two down and so much more to go! Today we are sharing our bright and brave Fireworks and Freedom collection celebrating independence, freedom and patriotism! There is so much to show you with this lovely and all-American collection new from Bella Blvd! Let's light it up! We don’t know about you, but our hearts certainly bleed red, white and blue! Celebrate your patriotic love with Fireworks & Freedom including Fourth of July, Veteran’s Day, Election days and more! Honor the land that we love by waving the stars & stripes proudly. Parades around town and firework shows encourage us to be united, brave and proud to be Americans! Doesn't this make you dream about summer and all things U.S.A.? Whether you want to celebrate a holiday like 4th of July, Veteran's Day, a military family/friend or just all the wonderful things in summer, this collection can cover all of it! The stars and stripes will be flying high in April as this starts shipping from Doodlebug. Welcome back friends! We are continuing to show you all of the newest collections and releases from Bella Blvd this winter! Today, it's all about Home Sweet Home and the cozy designs that feel like a place to relax and hang out with the people you love. Let's jump in and look at everything this collection has to offer! Every family has a story and home is certainly a feeling. Home Sweet Home is a colorful celebration of the people you love that are always welcome and the crazies that are your tribe. Inspired by Magnolia, we've created a colorful take on houseplants and mosaic tiles! Here's to family dinners, family drama and family life! After all, there's no place like home! Doesn't this just make you want to curl up in a blanket and sit by the fireplace? Or maybe sip a lemonade on your front porch with a good friend? Or maybe just whip up some yummy snacks in your sunny kitchen? This collection just makes us so happy to be at home and we hope you feel the same way! This will be available in April! Welcome to our reveal week! We have been so busy creating FOUR new collections, new embellishments and a brand new alphabet sticker set! There are so many goodies to share and we can't wait to get started. Stephanie has been working really hard and we hope that you love these new collections as much as we do. Let's get started!! Splish! Splash! Sunshine! Whether you're relaxing outside with a sprinkler or swimming like a fish in the pool, this summertime collection is for you. Dive in for a colorful good time of flip flops, floaties, sunglasses, waves and awesome water vibes! Enjoy the sunny days with Splash Zone from Bella Blvd! 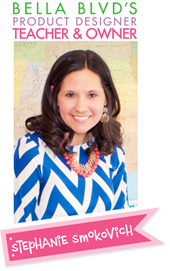 All of these products will begin shipping from Doodlebug this spring, starting in April. We can't wait to see all of the fun things you create with these new summer themed products! See you tomorrow for more reveals!! Birthday Week: Celebrating a December Birthday! Hi everyone, it's Tegan here with you today! My birthday is December 20th and for years I used to wish it wasn't right before Christmas. I'm finally learning to embrace my 'Happy Merry Birthday' and I documented that fact in today's layout. It was so easy mixing the super fun Wish Big Boy collection with the festive Merry Christmas collection! Come take a look! I first made a base layer with pieces of patterned papers from the Merry Christmas collection. I then embellished my photo with Merry Christmas embellishments, such as the gift die cut and the Christmas tree and candy cane chipboard pieces. 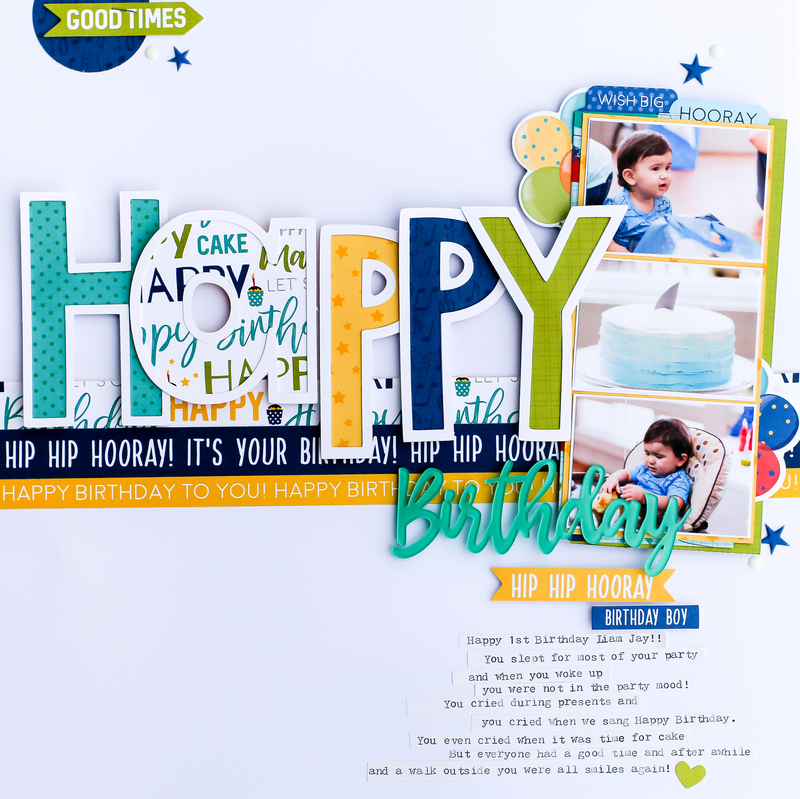 I then added the balloon bundle and crown die cut pieces from the Wish Big Boy collection. The only good photo I had from that day was of hubby and I, so I added the crown to myself in the photo to designate that it was my birthday. I guess you could say I was queen for a day then, right? Ha! I then added a few of the puffy heart stickers to chipboard and die cut pieces to give them a little extra dimension and color. (I love doing this!) 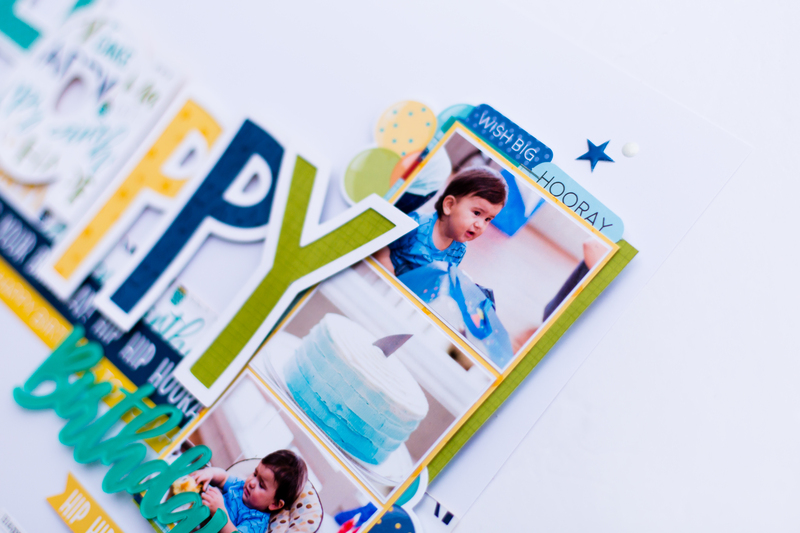 I used the navy blue chipboard 'HAPPY' from the Wish Big Boy collection to start my title. How cute is the blue on blue star pattern on these alphas?!?! To finish my title, I die cut the word 'Merry' from the Make a Wish paper from the Wish Big Boy collection using my Silhouette Cameo. I then used the Wish Big Boy pennant Ephemera pieces to make a curved banner to complete my fun title. I finished the layout by tucking a couple Wish Big Boy chipboard candles behind the Christmas tree chipboard piece. Thanks for joining me today! I hope I have inspired you to grab some Bella Blvd goodies and document a recent birthday celebration! Wish Big with a Twist! Hello Bella Friends! It's Leanne here today celebrating National Milk Day by sharing a layout using the new Wish Big collection! Probably not something you would normally consider linking together, but it just goes to show how versatile the Bella Blvd collections are. The vibrant colors from the birthday themed patterned papers and embellishments were perfect for documenting my story. One of the focus points on my layout is the title. The word "milk" created from Mind Your Manners fundamentals, has been mounted onto foam dots and layered directly on a die cut speech bubble from Wish Big Words Ephemera. The subtitle is a play on the ephemera words and stickers and is designed to mirror the journaling strips adjacent to it. My page has designated white space along the left side. This is to balance the many layers of patterned papers, stickers and clear cuts on the right. Each paper and embellishment has been selected based on the story I shared on the page. At first glance, the multiple layers don't appear to represent significant aspects of my journaling. However, I used the clear cut transparency to convey the message of needing x-rays to ascertain the nature of my son's injury, and the zig zag border sticker to represent the sharp pain he endured - both physical and emotionally. The puffy star stickers were used for the same purpose. And of course, when sustaining and injury, most people would probably see stars! Am I right?! Of the two photos used, I've kept the focus on the broken finger by printing it in colour. Each photo had been mounted onto small squares of Wish Big patterned paper, with more die cut ephemera squeezed between and overlapping the layers. I also made a visual triangle with a pop of lime green. If you have managed to read the journaling strips, you will note that this injury occurred at a critical time in the season for my 12 year old. He has an incredible passion for field hockey and was ultimately given medical clearance to captain both his State Title school boy team and State Title U13s competition. But the lesson learnt here was for him to be more aware of his diet, including drinking more milk, more often! Happy National Milk Day! Birthday Week: Birthday Girl Loves Ice Cream! Hello, Bella Blvd. friends! Tessa Buys here. 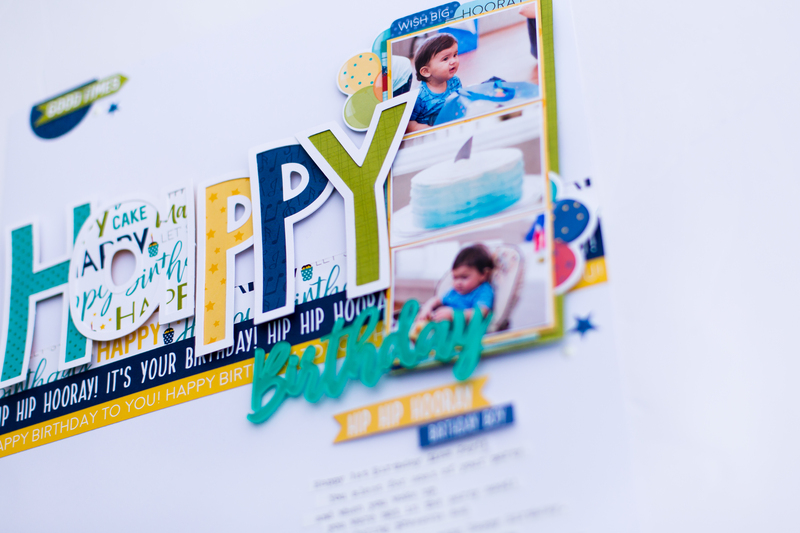 It's birthday week and I am excited to share this layout featuring the Wish Big collection and my little girl's third birthday. I pulled all but teal from the ice cream parlor photos - don't you love that blue and white checkered floor? I used the B-side of "Party Animal" as my background. The pink perfectly matches the strawberry ice cream! I printed three photos to show off her range of facial expressions: the smile for mama look, her admiring her birthday clown ice cream dish, and the third - of course - eating the ice cream. I didn't want to take too much away from these busy photos, so I decided to keep the rest of my background white and paint a large ice cream cone as an accent. I used the Illustrated Faith watercolors to paint a scoop, then used more IF watercolors to paint the edges of a cherry and a cone that I cut from more Wish Big patterned paper. I embellished the page with heart and sayings die cuts from the ephemera pack, as well as a few sticker hearts. And I can't seem to make a Bella Blvd. project without a bow, so a pink bitty bow adorns my focal photo. 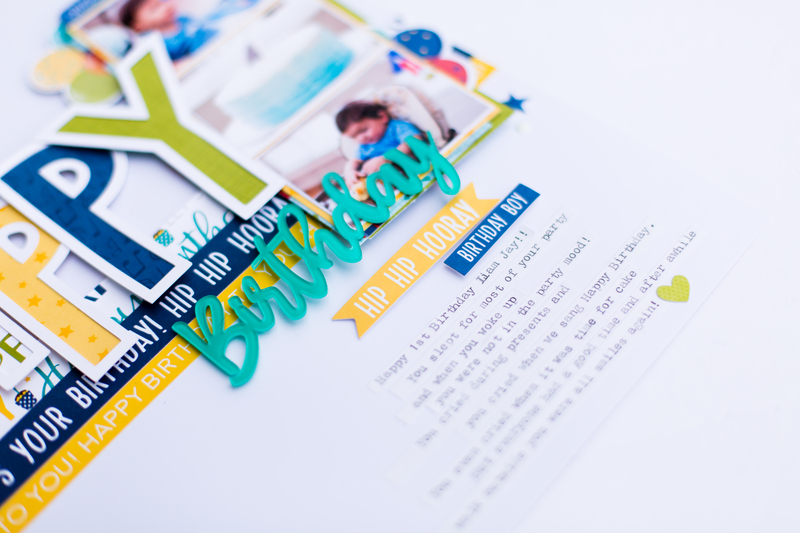 The title is a combination of an acrylic "birthday" and alpha stickers.To draw more attention to the title portion of the page, I added sticker edges to the bottom right corner. If you've got a birthday celebration to document, you aren't going to find a cuter line than Wish Big. And if you're like me and like to get a little paint-y, the IF watercolors will help you get the job done. Happy creating!